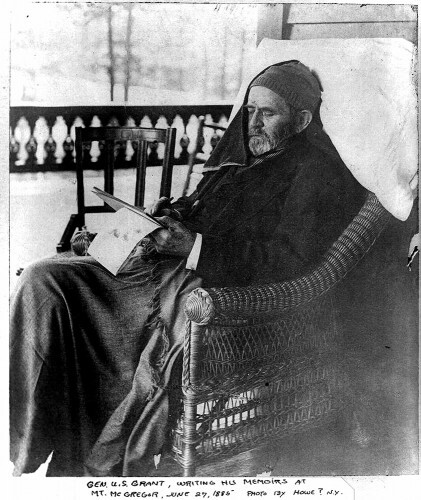 The Civil War - Accessible Archives Inc.
Years after his presidency, in 1884, the Grant family was reduced to poverty as the result of a failed business venture. That same year, President Grant was diagnosed with terminal throat cancer. Racing against time and while in considerable pain, Grant wrote his personal memoirs in hopes that they would provide his family with some financial security after his death. 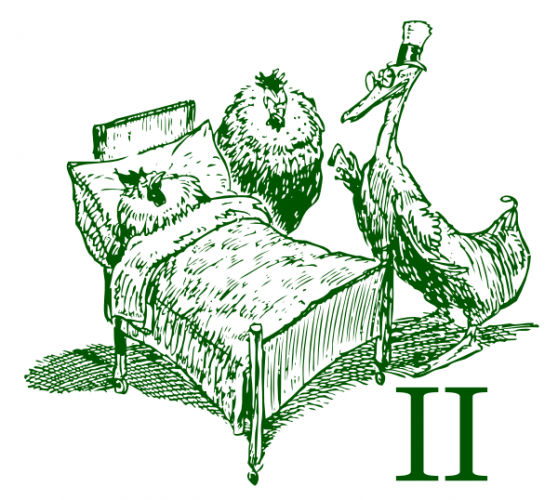 The two volumes were published by Grant’s friend and admirer Mark Twain the books enjoyed near overnight success. The books eventually earned the Grant family over $400,000. 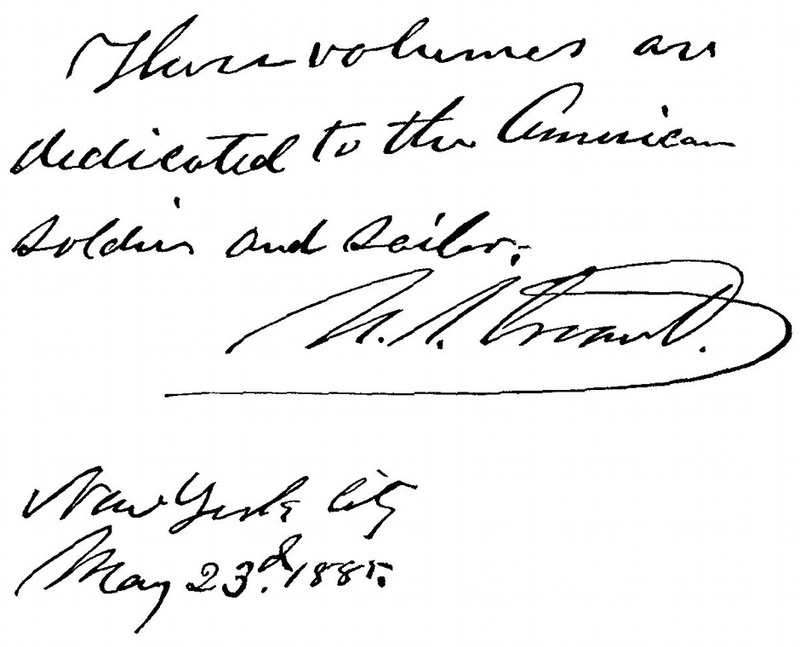 Grant completed the text just days before his death on July 23, 1885. His memoir is widely considered to be the best military autobiography ever written. The full text of both volumes can be searched and read by Accessible Archives users in The Civil War: The Generals’ Perspective. During the Civil War years Godey’s Lady’s Book carefully avoided taking a position or even directly mentioning the war from an editorial position. However, there were many patriotic songs published and other peripheral items. This set of Sick-Room Remedies was published during the height of the war in 1862. RICE BLANCMANGE — Steep a tablespoonful of rice in half a pint of cold milk for seven or eight hours. If the milk dries up too much, more must be added, but it must be no more than sufficient to make the rice soft and moist. Boil half an hour. Any flavor, either of almonds, lemon-peel, cinnamon, or nutmeg, may be added. When the rice is entirely pulped, it must be put into a mould until cold, when it will turn out. ISINGLASS BLANCMANGE — An ounce of isinglass dissolved in a pint of boiling milk, and flavored with bitter almonds, lemon-peel, etc., if boiled for some time together, will form an agreeable nutritious blancmange for a convalescent. When put into a mould, it should be stirred occasionally until it begins to stiffen. SAVORY MEAT JELLY — Chop a knuckle of veal and a scrag of mutton, so that they may be placed one bone on another. Scrape and slice three carrots and two turnips, cut small one head of celery, butter the bottom of a stone jar or well-tinned saucepan. Lay in layers the meat and vegetables alternately, packing them closely together. Sprinkle over each a very little salt; cover the jar closely, and put it in a slow oven for half an hour; then open it and pour in as much hot water as will cover the ingredients; cover the jar again closely, quicken the oven, and let it remain in it for five hours. Strain the liquor away from the meat and vegetables; when cold, remove the fat from the surface and the sediment from the bottom: the jelly will then be ready for use. It will not keep long unless boiled up again about the second day. GLOUCESTER JELLY — Dissolve one ounce of isinglass in half a pint of spring water; bruise and add to it half an ounce of nutmeg and half an ounce of cinnamon; let all simmer in a pipkin until the isinglass be perfectly dissolved; strain it off, and set in a cool place to jelly; cut it in pieces, add a bottle of port wine and the spice before boiled in it; sweeten it to taste, and let it simmer until the jelly be again dissolved, when it is ready for use. Half a wineglass may be taken at bedtime. Observe, the wine must not be simmered in a saucepan, but in an earthen vessel, put into a saucepan of cold water, and set over the fire to warm gradually. CARROGEEN, OR IRISH MOSS JELLY — Wash and pick an ounce of this moss; boil it in a pint and a half of water for twenty minutes; strain it and pour into a basin to jelly. For invalids, and for children when weaned, it is an excellent food mixed with warm milk. ARROWROOT JELLY — Put into a saucepan and boil together half a pint of water and one glass of sherry, or a tablespoonful of brandy, a little grated nutmeg, and fine sugar. When boiling, mix with them by degrees a dessertspoonful of arrowroot, previously rubbed smooth in a tablespoonful of cold water; boll all together for three minutes, and then pour it into glasses or small cups. If the invalid is not allowed to take wine, the jelly may be flavored with lemon or orange juice, or with the juice of any fruit which may be in season. APPLE WATER — Slices of apple, and a little lemon-peel and sugar put into hot water, make a pleasant drink. Many patriotic songs and poems were published during those years. This set of Sick-Room Remedies was published during the height of the war in 1862. LEMON WATER — Cut into an earthen teapot, or a covered jug, two or three slices of lemon, with one lump of sugar, and a spoonful of capillaire. On these pour a pint of boiling water, and cover it closely for two or three hours, when it will form an agreeable beverage for the thirst of a feverish patient. RASPBERRY VINEGAR — A dessert spoonful of which, in a tumbler of cold water, forms a very efficacious gargle. TAMARINDS and hot water, when cool, may in some cases be given; but no acid drinks should be given to patients without the knowledge of their medical attendants. WHITE-WINE WHEY — Dilute half a pint of new milk with an equal quantity of hot water; boil both together, and while boiling pour in at the moment two wineglasses of white-wine. A curd will form, which, after boiling the mixture for two or three minutes longer, will settle at the bottom of the saucepan. The whey must be strained carefully from the curd; it should be perfectly clear. Sugar may be added to please the taste. Warm white-wine whey promotes perspiration, and hence is useful in the commencement of some complaints; but taken cold, it has a different effect, and often, in cases of low fever, it is an excellent beverage; also, in the early stages of convalescence, it is as safe and sufficient a stimulant as can be given. MILK WHEY — Steep in a cup of hot water, for four or five hours, a small piece of rennet, about an inch and a half square. Pour the water, not the skim itself, into two quarts of new milk. When the curd is come, pour it into a sieve or fine earthen colander, and press the whey gently out of it into a jug. This may be given either cool, or made the warmth of new milk, whichever the patient prefers. LEMON AND VINEGAR WHEYS — Instead of wine, pour into the boiling milk and water a tablespoonful of lemon-juice or of vinegar. The whey obtained in this manner, being less stimulating than that of white-wine, is sometimes given to an invalid in preference. GROUND RICE MILK — Rub a spoonful of ground rice, very smooth, in a little cold milk; add to it three half pints of milk, some cinnamon, lemon-peel, and a little nutmeg; boil altogether for a quarter of an hour. Sweeten to the taste. SAGO MILK — Wash in cold milk a tablespoonful of sago, pour off the milk, and add to the sago a quart of new milk. Boil slowly till reduced to a pint. Cinnamon may be added if required; but neither sugar nor spice is usually added to this food. ARROWROOT AND MILK — Mix smooth, with a very little cold milk, one dessert spoonful of arrowroot. Boil half a pint of new milk, and the moment it rises to the boiling point, stir in gently the arrowroot and cold milk. Boil it till it becomes thick. MILK PORRIDGE is sometimes made by adding milk to fine groat gruel. Another way is to mix a tablespoonful of oatmeal in a basin with cold milk, and pour it, when perfectly smooth, into a saucepan containing half a pint of boiling milk. If this does not thicken it sufficiently, it must be boiled a little longer. Throughout the Civil War the publisher and editor of Godey’s Lady’s Book avoided reporting on the conflict and avoided taking sides. As a result, the magazine became something of an oasis away from the war for its readers. Although they never addressed the conflict and the casualties, this sewing pattern and instructions from July 1862 may provide a sideways hint that all was not well in the United States. Today the U.S. 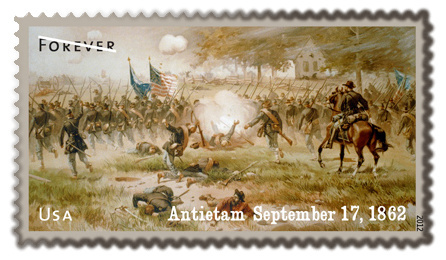 Postal Service issued the second of an annual series of Forever stamps that pay tribute to one of the most searing, traumatic and consequential events in our nation’s history: the American Civil War. There are ten philatelic products available for this stamp issue. –Dean Granholm, vice president, Delivery and Post Office Operations. Mail was a treasured link among Civil War camps, battlefields and home. Recognizing its importance to morale, both northern and southern armies assigned personnel to collect, distribute and deliver soldiers’ mail. Wagons and tents served as traveling Post Offices. Download this news release (PDF) for additional information. 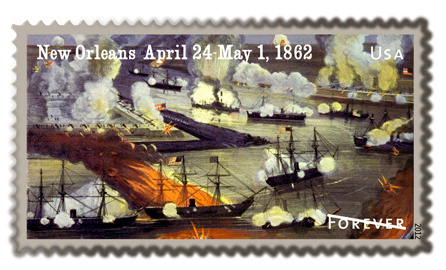 The Postal Service also offers first-day covers for new stamp issues and Postal Service stationery items post­marked with the official first day of issue cancellation. Each item has an individual catalog number and is offered in the quarterly USA Philatelic Catalog, online at usps.com/shop, or by calling 800-782-6724.